For the month of January, get any standard Vermont Soapstone sink FREE with a 40+ square foot installation by Vermont Soapstone booked this month. *Minimum slab order of 40 square feet required. Your project does not have to be installed during January, just book it this month. We install throughout the North Eastern U.S.
March Special: Get 10% off your kitchen countertop installation by Vermont Soapstone! *Minimum slab order of 40 square feet required. Your project does not have to be installed during March, just book it with us before April 1. 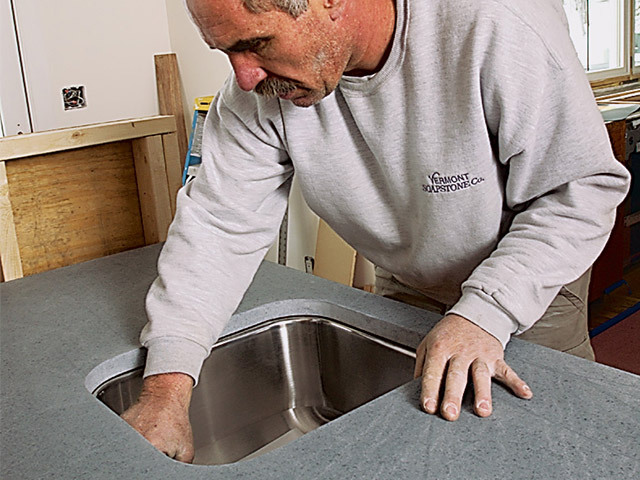 We install throughout the North Eastern U.S.
At Vermont Soapstone, we’re pleased to offer expert installation of our sinks and counter tops in most eastern states. Our “soapstone road show”, as we fondly refer to installation teams, have been traveling throughout the eastern United States for twenty years and have enjoyed working in a variety of settings. From a penthouse overlooking Boston Harbor to a secluded beach cottage on Maryland’s Chesapeake Bay, each project presents a new set of opportunities for us to highlight the versatility of soapstone. 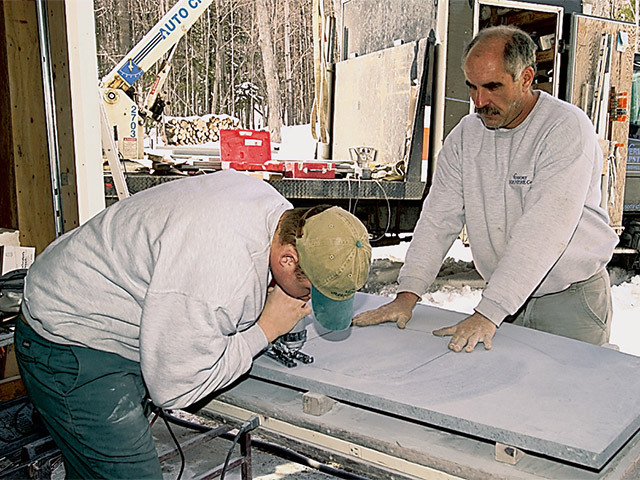 While we’re always happy to advise your contractor about installation it is important to remember that, when you contract us for the installation, the crew working at your home is employed by Vermont Soapstone. 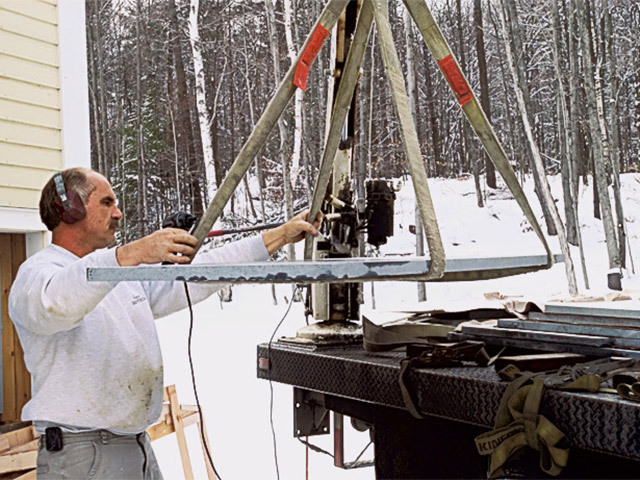 Our crews travel each week from their homes here in Vermont. Most installations require a day or two’s work. We like to arrive early and work through the day. We require that someone be available at the start of the day to answer any quick questions and at the end of the day to sign off on the completed job. Cutting on site means that we handle all final measurements. All cutting to size and sanding of the soapstone is done at the job site, so it can get quite dusty. But you can be sure that we make every effort to keep a clean work site, and clean up well when our work is done. 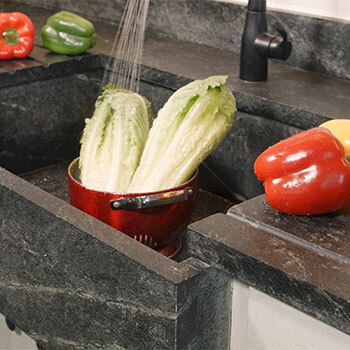 The only exception to the cutting on site would be if you have a soapstone sink. All sinks must be built at our mill. It is important that all cabinets that we are installing stone on, as well as any non-soapstone sinks, are in place before we arrive. When conditions are such that a workspace at the job site is not available, we also offer a template service. 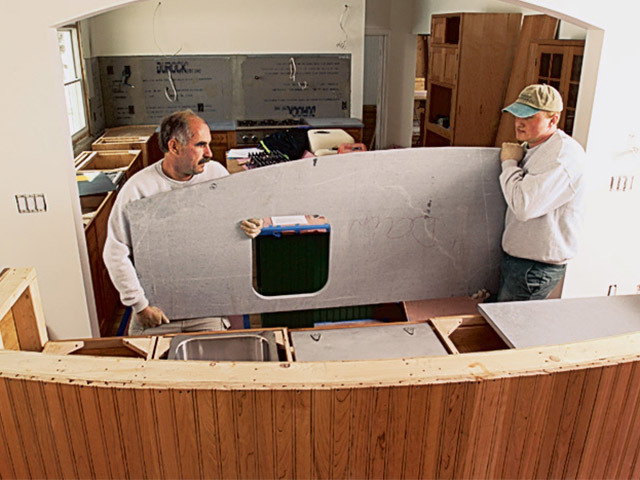 Our template crew will travel to the job site when the base cabinets are set to make a wood template. Generally we’re ready to install the tops 2-3 weeks after the template is made. Please contact us for an installation estimate, sales@vermontsoapstone.com or FAX (802) 263-9451. With no investment in special tooling, we guarantee that any experienced contractor can easily perform soapstone installation. Plus, we are available to consult with your contractor every step of the way. Cutting: Masonry blade in skill-saw or table-saw. 8-10 TPI blade in jigsaw. Total support of work and cut-off. Drilling: Metal speed bit or hole saw. Shaping: Wood rasp or carbide router bit. Counter/Vanity Tops – Set tops and backsplash with panel adhesive (we like Phenoseal), seal joints with two-part translucent epoxy (for stone, glass or metal). Finishing: 40 Grit sanding belt to match slab, 80 Grit to finish before oiling counters. Masonry: Thin set mortar (Silpro Masco) with a bonding agent (Silpro C-21). Sinks: Bench test after uncrating. Install with support from bottom. All sinks manufactured for I.S.E. disposal (Ace, Sears, Kitchen Aid) or Chicago Specialty’s Spin and Lock Basket (Ace). Tile: Set with thin set mortar with bonding agent or with tile adhesive. Grout to match or contrast.